The BrandTech Dispensette S Analog Bottletop Dispenser builds on the 50 year history of BrandTech dispensing expertise. Continual upgrades make the BrandTech Dispensette S Analog Bottletop Dispenser one of the safest and most convenient bottletop dispensers ever, while retaining the features that make this bottletop dispenser one of the world’s favorite bottletop dispenser, preferred by many scientists in labs around the globe. The “floating piston” design of the BrandTech Dispensette S Analog Bottletop Dispenser forms a zero-wear sealing system with outstanding sliding properties. Optimized flow channels make dispensing and priming even easier – particularly in instruments with large volumes. 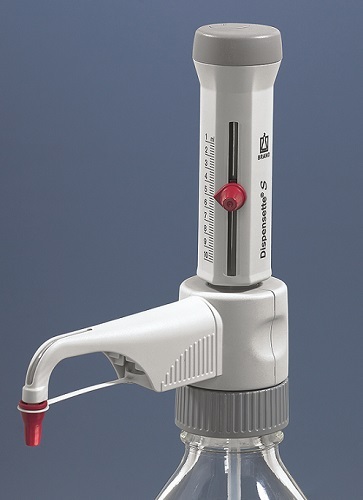 The BrandTech Dispensette S Analog Bottletop Dispenser is supplied with: discharge tube, valve mounting/calibration tool, polypropylene adapters, telescoping filling tube, recirculation tube (optional), performance certificate, operating manual, and one year warranty on the BrandTech Dispensette S Analog Bottletop Dispenser itself. Dispensette S Buy 3, Get 1 FREE! 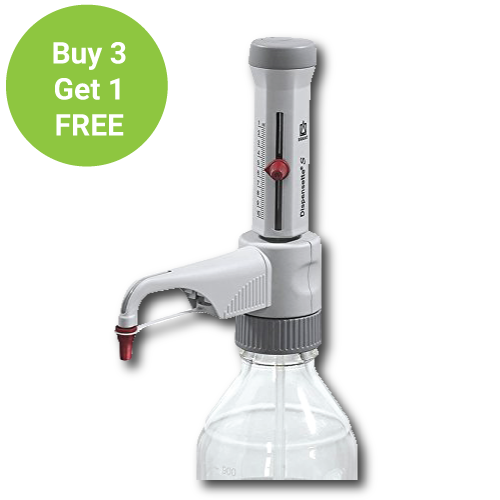 • Buy 3 Dispensette S dispensers, get one of equal or lesser value for FREE!